This week is National Library Week. Let me tell you, with my reading habit, if I didn’t have libraries (yes, I use more than one! ), I would be in serious trouble–emotional and financial! I still pretty much check out the maximum number of books the libraries will allow & that I can carry. I love browsing the new-book shelves for surprises, and I love running across an old favorite I haven’t thought of for years…and that I get to read again. Still, even without the country or a lake, the summer was a fine thing, particularly when you were at the beginning of it, looking ahead into it. There would be months of beautifully long, empty days, and each other to play with, and the books from the library. In the summer, you could take out ten books at a time, instead of three, and keep them a month, instead of two weeks. Of course you could only take four of the fiction books, which were the best, but Jane liked plays and they were nonfiction, and Katharine liked poetry and that was nonfiction, and Martha was still the age for picture books, but they didn’t count as fiction but were often nearly as good. Mark hadn’t found out yet what kind of nonfiction he liked, but he was still trying. Each month, he would carry home his ten books and read the four good fiction ones in the first four days, and then read one page each from the other six, and then give up. Next month he would take them back and try again. The nonfiction books he tried were mostly called things like “When I was a Boy in Greece,” or “Happy Days on the Prairie”–things that made them sound like stories, only they weren’t. They made Mark furious. “It’s being made to learn things not on purpose. It’s unfair,” he said. “It’s sly.” Unfairness and slyness the four children hated above all. The library was two miles away, and walking there with a lot of heavy, already-read books was dull, but coming home was splendid–walking slowly, stopping from time to time on different strange front steps, dipping into the different books. One day Katharine, the poetry lover, tried to read Evangeline out loud on the way home, and Martha sat right down on the sidewalk after seven blocks of it, and refused to go a step farther if she had to hear another word of it. This will tell you about Martha. After that Jane and Mark made a rule that nobody could read bits out loud and bother the others. Who could resist? Happy National Library Week. Go, celebrate, read! Wow, a bookmobile! Haven’t seen one of those in twenty years. Cheers for libraries. And that’s our NEW bookmobile–about 4 years old or so. We live just a bit out into the country, and son’s old elementary school is one of the stops. 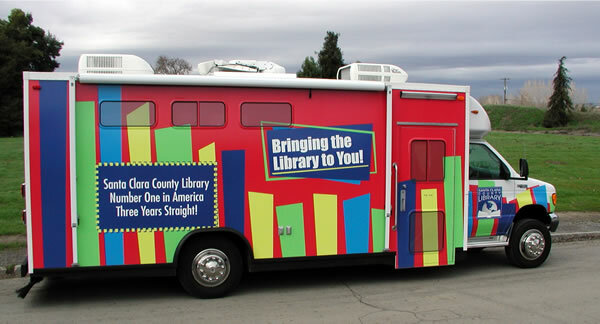 It is SO convenient–and the librarians on the bookmobile are the BEST!